In a regenerative medicine study, focused on healing soldiers injured in Iraq, Dr Burt Ensley discovered a new element derived from plant biotechnology called Tropoelastin which promotes scar-less healing. 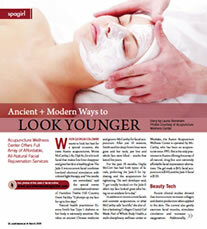 Many of the same factors causing scarring of tissue are identical to anti-aging issues. This proprietary ingredient in the Dermalastyl product line used in Elastin Infusion Therapy was discovered in this Department of Defense research project and is now called Elastintropin. The product penetrates the outer layers of the skin and replenishes lost elastin. The company has written a protocol using micro-current technology such as the Jade machine uses, to effectively infuse the Elastintropin into the skin where it synthesizes components of the human skin. The elastin protein helps the body to retain collagen, thus you stay more hydrated after each facial and the area around the eyes and mouth are plumped and lifted. The process is so effective and potent that it is recommended that it only be applied once per month. For patients 40 and older the process is estimated to replace up to 2 years of lost elastin with each treatment. • Phase 1 consists of the application of an all natural moisturizing cream (MCR) containing some elastin protein, collagen and other moisturizers as used in the Jade micro-current facial. • Phase 2 is the application of the Chaperone Cream which is a vasodilator that will help carry the elastin protein deeper into the skin. • Phase 3 is the application of the Pure DermaLastyl Elastin Protein. • Phase 4 is the application of hot towels and the final migration of elastin protein. This process takes about 2 to 5 minutes. The final result is softer, smoother and tighter feeling skin and a noticeable plumping of the area under the eyes, cheeks and around the mouth with an overall “lifting” affect. Each application is estimated to replace up to 2 years of lost elastin. A Painless and Relaxing Treatment! 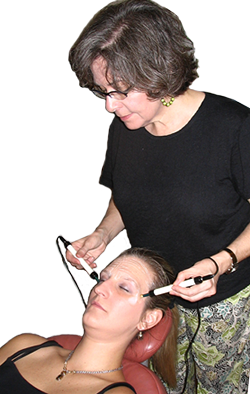 The Elastin Infusion micro-current facial uses no injections, no scraping and no squeezing of delicate facial tissues — so sessions are completely painless and very relaxing. The results are immediate – and the treatments have a significant cumulative effect as the skin has increased circulation, hydration and collagen production. Treatments are administered once a month depending on your individual skin condition. A series of 5 to 10 treatments could essentially restore up to 10 to 20 years of lost elastin. Since patients see results with their very first treatment, the Jade Plus micro-current facial is an excellent choice for a quick beauty boost prior to any special event where you want to look your best!